For disabled individuals like myself with muscle wasting, progressive conditions their complex needs require regular monitoring. Getting something like a GP appointment though is easier said than done, partly due to the amount of GP time being wasted from missed appointments. I am on four different daily medications with a number of side effects that need to be looked at on a consistent basis. Prednisolone, for example, a form of steroids helps to slow down the progression of my disability, Duchenne Muscular Dystrophy, keeping me physically more active for longer but it also contributes to making my bones weaker. And not only does my medication make my needs more complex with a greater number of appointments, but being permanently in a wheelchair for instance means I have to also make sure the chair is adapted to suit my changing needs. Therefore, there is a serious need for me to book medical appointments quickly, especially given my condition worsens over time. But this is difficult when health professionals like GP’s are only available at certain times. Even if I just have to wait a couple of months to see a GP by the time the original problem has disappeared another issue will have arisen. 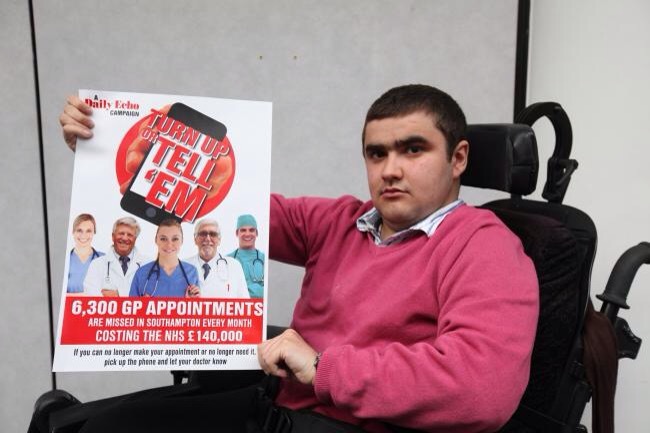 GP’s are just one of the many different types of medical professionals I have to see, but if people with complex disabilities cannot get an appointment with a GP this could potentially have a severe impact. In my case they would be unable to check the effects my medication is having on my bone and skin health, two of the primary side effects of my medication. Living in Bishopstoke, the revelation last week, that 6,000 GP appointments are being missed each month in Southampton, my nearest city, is worrying to say the least. If in hindsight practices knew appointments were going to be missed GP’s would have more time available for patients in desperate need of appointments. Every time I try to see my GP I am told I have to book an appointment for six weeks’ time because of how preoccupied with other patients they are, but these other patients may not actually be attending appointments. It is understandable if they cannot make an appointment for a legitimate reason, but even just informing the surgery would mean practices could try and free up space for someone like myself so I could get seen to quicker. Having to book a GP appointment six weeks in advance is not ideal because I cannot always plan what will happen in the future. With my condition, I have greater susceptibility to illnesses as my immune system is not as strong so I could fall ill when I am meant to be at the surgery or even just back pain, which I occasionally suffer from, may stop me from being able to attend. Also, I may all of a sudden have to arrange to see someone like a physiotherapist and their available time could easily clash with the GP’s available time. There is the option of sitting and waiting for a GP when in an emergency, but this is impractical as the appointment could be in the evening when I tend to be fatigued and I am currently studying and living in Winchester. Given the challenges I face to see my GP, it is easy for me to respect why people cannot always attend appointments because they probably have some of their own difficulties that I am unaware of. But, it would be surprising if this was the case for everyone given the sheer number of patients missing appointments. GP’s are important to me as they explore options for treating side effects of my medication and only the GP is able to refer me to a doctor or consultant who can arrange x-rays to monitor other side effects. Because I realise how detrimental to my health missing these appointments could be I rarely fail to turn up and always book them well in advance. Even if I do get to see my GP though, in the process my health has been affected. I have enough stress in my life without having to deal with the worry that I may not get an appointment for an urgent matter out of my control and this is a familiar problem with others in my position. Wasted GP time is obviously having significant financial implications to the NHS fact but when people with complex needs are facing difficulties making appointments patients missing them should maybe think twice about doing so.